Seoul (VNA) – Deputy Foreign Minister Ha Kim Ngoc and a Vietnamese delegation attended the eighth Foreign Ministerial Meeting (FMM-8) of the Forum for East Asia – Latin America Cooperation (FEALAC), which took place in Busan city, the Republic of Korea (RoK) on August 31. The event, themed “One Vision, New Action”, attracted the participation of 36 member countries from the two regions. Speaking at the event, Ngoc said Vietnam supports measures and action plans to strengthen regulations and improve the operation efficiency of FEALAC. In the near future, the forum should prioritise strengthening internal connectivity via raising responsibility of member states, expanding cooperation with regional and global financial – banking organisations, increasing the scale and number of regional and inter-regional-scale projects, especially those regarding sustainable development, food and energy security, climate change response and water resources management, he said. The participants adopted the Busan Declaration which described the forum as the only inter-governmental cooperation mechanism connecting East Asia and Latin America together which account for 38 percent of the global gross domestic product and one third of the global trade. Participants agreed to establish a key group comprising six coordinating countries from the two regions and the FEALAC Trust Fund which will be run by the United Nations Economic and Social Commission for Asia (ESCAP) and the Pacific and the Economic Commission for Latin America and the Caribbean (ECLAC). The meeting also passed the new action plan of the FEALAC with the three pillars of strengthening operating mechanism of FEALAC, promoting projects at the national and trans-national level, bolstering ties with regional and global organisations while approving reports on reviewing the tenure of the 18th Senior Officials’ Meeting (SOM) and Working Groups. The FMM-9 is scheduled for 2019 and Laos will host the SOM-19 in 2018. During the stay, Ngoc met with Argentine Foreign Minister Jorge Marcelo Faurie, Colombian Deputy Foreign Minister Patti Londonno Jaramillo, Chilean Under-Secretary for Foreign Affairs Edgardo Riveros Marin, Deputy Minister for Multilateral and Global Affairs of the Republic of Korea Choi Jong-moon, and Japanese Vice Minister for Foreign Affairs Nakane Kazuyuki. At meetings, both sides agreed on measures to boost bilateral ties, especially facilitating visits at all levels, maintaining existing cooperation mechanisms and refining the legal framework for coordination via negotiations and signing of cooperation documents, particularly in the fields of economy, trade, investment, agriculture, culture, science-technology and training. On multilateral collaboration, these countries expressed wish to further tighten joint work with Vietnam at international organisations, especially at the United Nations. 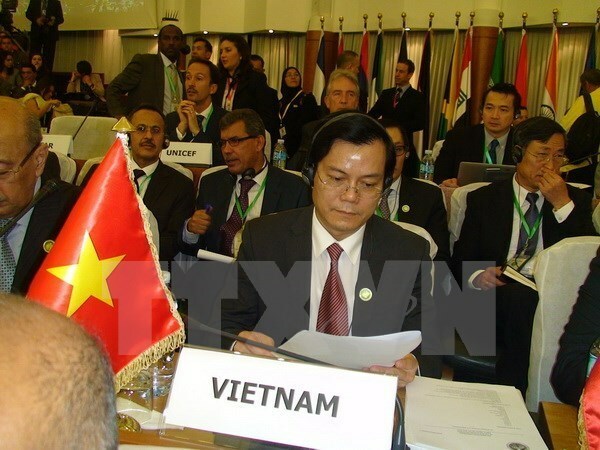 They pledged to actively consider Vietnam’s request to support its bid to run for a seat at the UN Security Council for the 2020-2021 tenure and the position of the UNESCO General Director for 2017-2021.